ROARING FORTIES™ Aviation Lifejackets. CASA ATSO 1C13 approved. 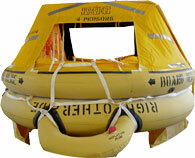 ROARING FORTIES™ Aviation Life Rafts. CASA TSO C70a approved.